On Saturday I attended the morning session of the 9th Annual Tolkien at UVM Conference as a part of my Tolkien & Medievalism class at Saint Michael’s College. Taught by Dr. Kerry Shea, the class has involved a semester of reading Tolkien’s major works accompanied by medieval classics such as Beowulf in order to discuss and explore the roots of his created world and how it has fathered today’s concepts of fantasy. University of Vermont has a similar class and offered this conference to professionals and undergraduates alike to share ideas. The theme of this year’s conference was Tolkien’s Bestiary, thus focusing mainly on the creatures of Middle-Earth and beyond. The day started with the reading of several undergraduate papers: an analysis of language and the complex etymology Tolkien created; a look at the premise of light vs. dark in the fantasy world; and a modern-day comparison of Gandalf and Dr. Who. The next session included three scholars: Martha Monsson, Andrew C. Peterson of Harvard University, and Matt Dickerson of Middlebury College. Monsson’s piece, titled “Forth Eorlingas: Horses and Ponies in The Lord of the Rings” traced the various differences between horses and ponies in LOTR, and what each shows about the peoples who use them. For example, the hobbits only use ponies because of their size, but they also value their endurance and labor use, showing their simple and humble natures. The horses of Rohan, on the other hand, are bred for heroic warfare, representing freedom and the status of the owner. Monsson looked at Shadowfax and Gandalf, as well as Gandalf’s treatment in general of horses. There are many origins in Anglo-Saxon history involving horse tactics in battle; the idea of the beast vs. a machine is also an interesting idea she explored. From the language Tolkien used to shape his horses to the meanings behind the colors of certain specified horses, Monsson’s paper was very thorough. 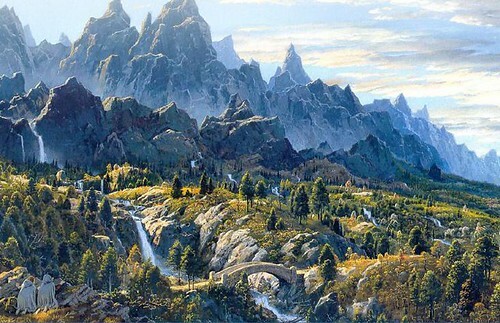 Peterson wrote “The Many Faces of Trolls in Middle-Earth” to investigate the uncertainties surrounding trolls in many of Tolkien’s works: their very nature shifts between stories. Tolkien’s trolls seem to be derived from Old Norse, and could be a combination of dwarfs and giants because of the many shared characteristics. Grendel also may be an inspiration for these characters. Tolkien seemed to have preferred folklore versions instead of the tamer English fairy-tale creatures, despite the trolls in The Hobbit that provide comedic relief with an apparently Cockney accent. The trolls in The Lord of the Rings and The Silmarillion seem much more threatening: they are servants of Sauron and accomplices with the Balrgos of Moria; they are described as Ents that were twisted and mutilated. In The Lord of the Rings, Sam’s troll-song connects the story to the larger picture of Middle-Earth that we find in Silmarillion. This was a very interesting study for those of us who have recently read Silmarillion, and certainly caused me to think about Tolkien’s process. The final paper of this session was “From Goblins to the Valarukar: Scourges of Fire and Demons of Terror” by Dickerson. He looked at some very interesting connections both in plot and language between the Balrogs and the Orcs, or the Valarukar and the Goblins. The idea of the Balrogs may have come from a poem in Old English that told of creatures of shadows and flames. The Balrogs remain creatures of mystery, however, since few of them are ever named. One commenter posited that Balrogs are a supernatural version of the more earthly trolls, since they do work together at times. We know that the Balrogs are a dark version of the Maiar, placing them on Gandalf’s level, which explains the repeating motif throughout Tolkien’s created history of wizards and Balrogs slaying one another. Gandalf’s resolute speech to the Balrog in Moria ties both of their stories back to what (little) we learned in Silmarillion about Iluvatar’s imperishable flame. Dickerson also considered Tolkien’s creation of Orcs, possibly taken from George MacDonald’s The Princess and the Goblin. The name in Old English means demon-spirit or demon-corpse—which may have been where Tolkien got the idea for the Ring-Wraiths—but the concept is a darker version of a goblin. This was another fascinating paper for the creative, Silmarillon-educated mind. All in all, it was a great experience which allowed us to cultivate new thoughts on Tolkien’s process with creatures, language, creation, and story. I know I have some great ideas for our final term paper, and am looking forward to reading and re-reading these classics in even more depth.